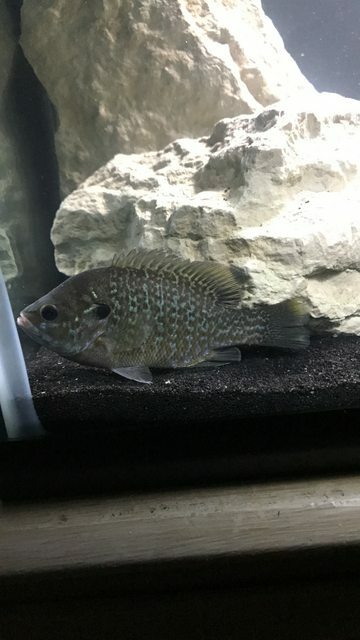 Can someone give me some tips on identifying what type of sunfish I have? I thought I had a pumpkin seed but now that i'm looking at it I think it's a hybrid and I want to know what kind! He's in my 29 gallon right now, neat fish. I didn't take a picture of it at the site since I thought for sure it was a pumpkin seed. So anyways some tips or pics would be helpful thanks! Edited by juhason, 09 September 2017 - 10:32 PM. A picture is the first thing you do. Post it and we can discuss characters to look for. Here is a picture of him last night. He had some blue and green hues when I caught him which was why I thought it was a pumpkinseed. But then I remembered they also have yellow/orange and that red dot on the gill flap which mine doesn't have. On really really close examination, his gill flap has a white outline with VERY faint red along almost the entire flap. Edited by juhason, 10 September 2017 - 07:10 AM. Based on relative eye size it has been growing fast. Coloration is impacted by stress and dark background. Relatively large mouth and short dorsal spines suggest Green Sunfish or Warmouth. Olive pattern of Warmouth and it's hybrids not evident on operculum. Dorsal spot typical of Bluegill and Green Sunfish. Greyish patch along lower margin of operculum is only associated with Bluegill, especially the northern variety. I think it a hybrid between Green Sunfish and Northern Bluegill. Reds and oranges I do not trust in fish that are likely to hybrids as those are not always intermediate between what you see in parents. Thank you so much for the details! I was way off haha. But now that you mention all those things and I looked up a picture of a pumpkinseed it's pretty clear lol. Thanks again! I hope he'll do ok in a 55 that's the biggest tank I have at the moment. I know bluegills and greens get pretty big but we'll see. Looks like the hatchery sold hybrid sunfish to me. Greengill. Edited by juhason, 11 September 2017 - 07:14 PM. Yes, typically listed as hybrid bluegill. Hatcheries push them as they grow fast and reproduce less. Apparently they reproduce less because the hybrid is predominantly male. They also are somewhat easier to catch, probably due to a more voracious appetite and larger mouth than a pure bluegill. They don't ship via post to the best of my knowledge. To purchase you would probably need to contact Jonah's or maybe Zimmermans. Here is another near me. The superior growth falls apart once the fish get some size on them. The hybrids are more aggressive feeders when small. From what I have seen, the gape size is not that import when the majority of ingested prey are invertebrates or pellets. Gap size might be important if forage base if dominated by fish or crayfish. I have made many different hybrids, some not referenced in the literature. Still, in the end, pure are generally more fun. Cool! thanks for the links! I'll check it out. And centrachid I normally am a huge lover of pure, natural, wild coloration, biotope, all of that.But this is going in my show tank in the living room of my house. I don't find bluegill or green sunfish particularly attractive by themselves but together obviously their colors are great! I need to keep this tank "interesting" to the common person since I am living with my parents and they barely want me to have a tank there in the first place haha. I used to be a common person. Depending on where you are, there a lots of pure options that will meet your needs and likely be less imposing to the eyes of your parents. I have had parents too. You have not seen Bluegill or Green Sunfish pumped up in small social groups. Managing for brats can give more interesting colors and behaviors. I live in northern Illinois, Chicagoland area. If I could find northern longears or orange spotted sunfish that would be amazing but I have not found a good spot to find these yet! I also love rainbow darters, spotfin shiners and red shiners but also have never seen one. All i ever catch are bluegills, greens, topminnows and bluntnose minnows. Also i'm wondering if my tank would be big enough for a shoal of bluegill or greens I only have 55 gallons. Edited by juhason, 12 September 2017 - 08:57 AM. You could do six bluegill just fine. You do not have any rocky bottom streams near you? Without actually sampled your area, I would think you have Northern Longear nearby. After the second year I have regretted stocking them in my pond. Only hybrids I like to work with are close to sterile. You can replace the hybrids over time by establishing pures. I suspect that there were enough fertile male and female hybrids that they have spawned enough times now to start to "play out" or revert towards their natural phenotypes. I have some fish now that are hard to distinguish from pure cyanellus though none were ever introduced. Unless you believe in bird introduction, then it is not very possible that they were introduced otherwise. Plant ten seeds from a hybrid tomato. Depending on parent variety, you may get 2 or more distinctly different plants. Same here in theory. Some offspring were more green, some more bluegill. Like breeds to like, preferably anyway, and now I have fish that are mostly cyanellus and others that are mostly macrochirus. I actually like green sunfish, but would have preferred to not have them in my pond. Thoughts? Apologies juhason. I hope that I am not diverting your thread too much. Green Sunfish are the most capable fish I know of when it comes to colonizing a pond by swimming up drainage during heavy rains on warm summer nights. A couple hundred yards is no out of the question. True reversion not likely possible. I have seen self-sustaining hybrid populations drift to look like green sunfish but they are not quite right in terms of appearance. It would take a lot longer / more generations than typically possible for the ploidy problem of the hybrid population to self correct. Generally water body becomes no longer or pure Bluegill or Green Sunfish get in and displace them. A hybrid population in a coal strip pit that was at least 30 years old still had not stabilized. That was 35 years ago so may need to go check it again. Then I suspect the hybrids I purchased had some greens in the mix that I didn't see. Or maybe they did travel, but my pond is very far removed from any other permanent body of water. During big rain events we do get a substantial flow. There is another pond about a mile away, but it drains into another ditch, but during heavy rains it can back up enough that some flow may head my direction.